Do your lips pucker up at the mention of a kiwi? Maybe it’s just me… All too often I’ve eaten sour kiwis, especially in the winter, no matter how long I let them ripen on the counter. Luckily in the summer, sour kiwis aren’t a problem, and in fact I ended up with a surplus of ripe kiwis recently. So I’m excited to be sharing with you some refreshing kiwi vanilla cupcakes with kiwi buttercream frosting that taste just like eating a ripe kiwi, and hopefully you’ll have a chance to try it out before the summer is over! When my box of kiwis from the wholesale club decided to all ripen at the same time, my gut instinct was to make kiwi cupcakes. But having never done it before, and given that kiwis have quite a bit of moisture to them, I looked to the internet for guidance. As it turns out, not too many people have done straight up kiwi cupcakes with kiwi frosting. Almost all the posts I saw were strawberry kiwi cupcakes, which sounded great, but I didn’t have any strawberry. I ultimately ended up combining two recipes: a strawberry cupcake base that substitutes kiwi for the strawberry, and a delicious-looking kiwi buttercream recipe that uses the surprising ingredient salt for a great kiwi flavor. 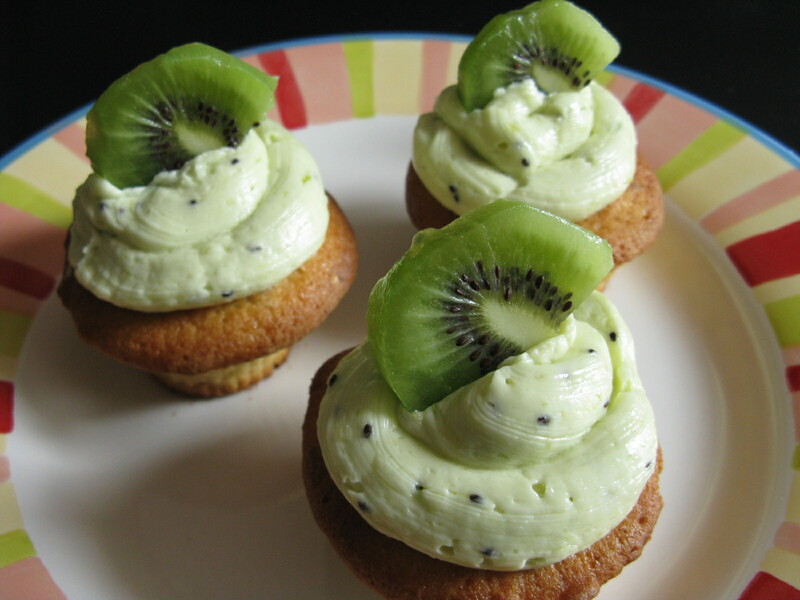 It was important to me that the kiwi flavor would come through in both the cupcake base and the frosting, and I loved the idea of having flecks of the jewel green kiwi fruit and black seeds throughout. I also recently purchased a set of fluted silicone cupcake liners, in the hopes that I would be to save money on cupcake liners when I’m baking for myself or small parties, since I never seem to have cupcake liners on hand when I want to use them. The interesting part was being able to pop out the finished cupcakes from the silicone cups without needing to grease them, they came out like magic! I also liked the smooth fluted sides of the cupcakes that looked so neat and clean compared to the crumbs and mess that comes with peeling back a paper liner. Unfortunately, the lesson learned is that silicone is neither good for heat retention nor heat conduction, so my cupcakes took WAY longer to bake than they should and ended up getting very browned on the tops and bottoms before the inside was even cooked through. When they were finally done, the taste was still wonderful, just the tops were a bit over-done with all that extra time. The silicone was a huge disappointment, so I think I will go back to using regular paper liners. Alas, we were not meant to be. I suppose I’ll hide the silicone liners away until I find another use for them that doesn’t involve heat and baking. I bet they’ll be good as molds for things like gelatins, mousses, and no-bake cheesecakes. 1. 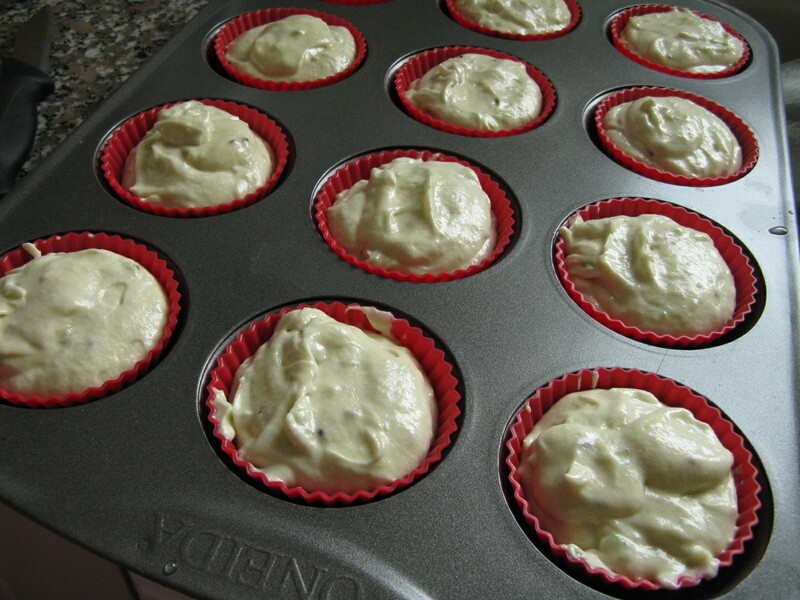 Preheat oven to 350 degrees F. Line a 12-cup muffin tin with cupcake liners (I do NOT recommend using silicone liners). 2. Peel the 3 kiwis you will need for the cupcakes and frosting, and mash them well using a fork, trying to break up large chunks. See the consistency of the mashed kiwi below for reference. 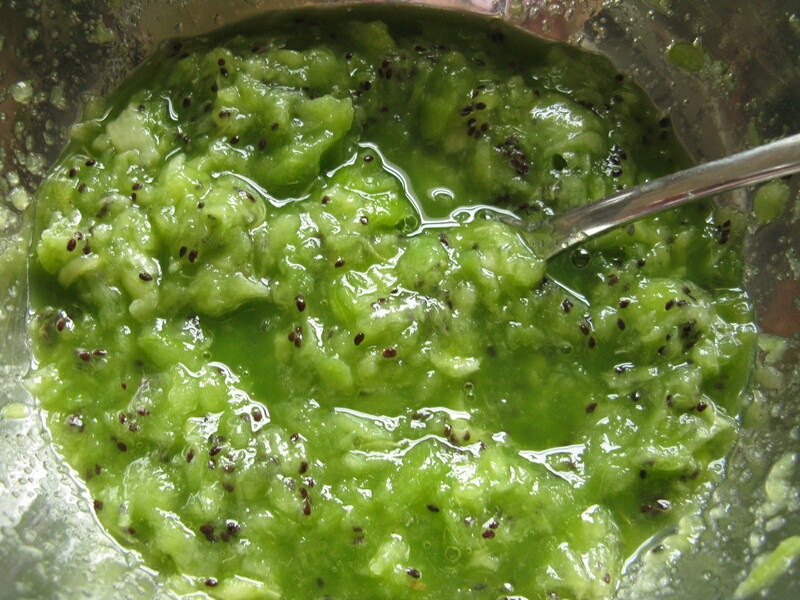 If your kiwi is not soft enough to mash with a fork, puree it in a food processor or blender. 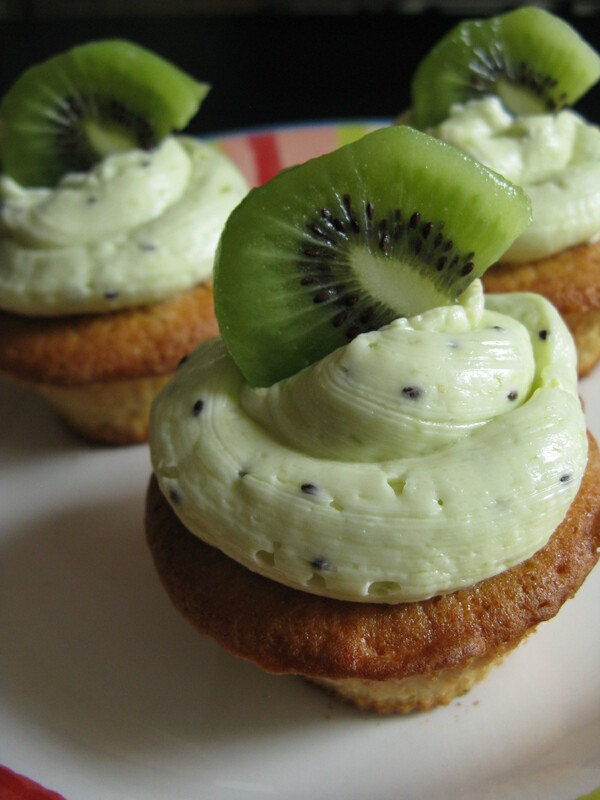 You will use 1/3 cup of the mashed kiwi for the cupcakes, and the remainder can be set aside for the frosting. 3. 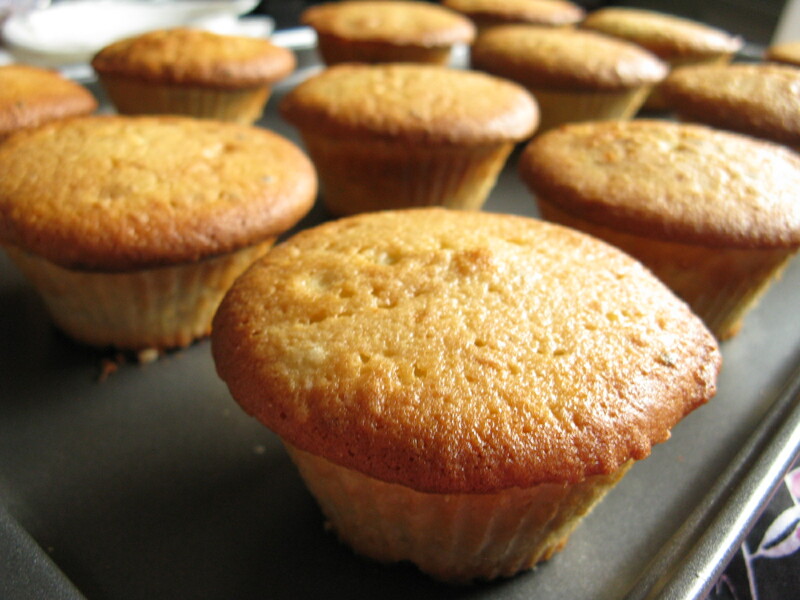 In a medium bowl, mix together the flour, baking powder, and salt for the cupcake base. 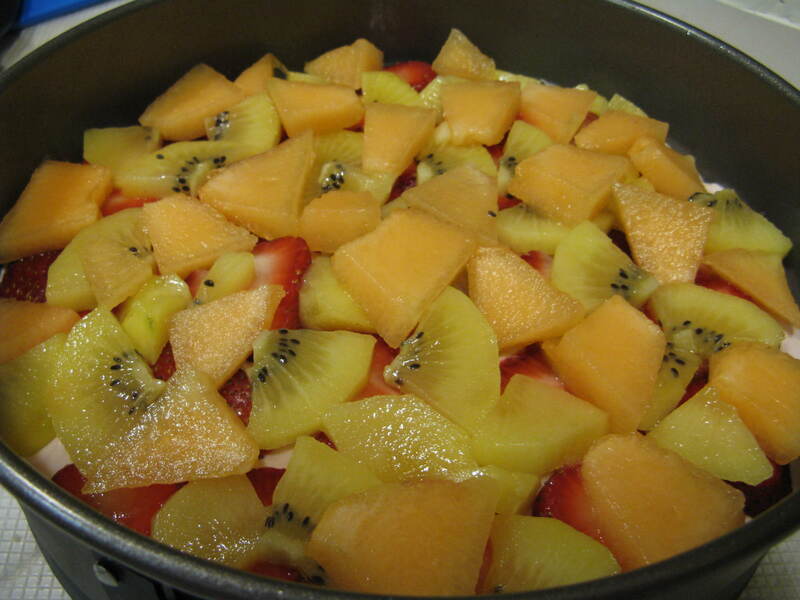 In another small bowl, mix together the milk, vanilla, and the 1/3 cup mashed kiwi. 4. In a large bowl, cream the 1 stick of butter with an electric mixer on medium-high speed until light and fluffy, then add sugar and continue beating until fluffy. Turn down the speed to medium and blend in egg and egg whites until just blended. 5. Turn mixer to low speed and add half the flour mixer, mixing briefly until just blended. Then add the milk and kiwi mixture, blend briefly until just combined. Finally add remaining half of the flour mixture, scrape down sides of bowl, and finish mixing just until blended. 6. 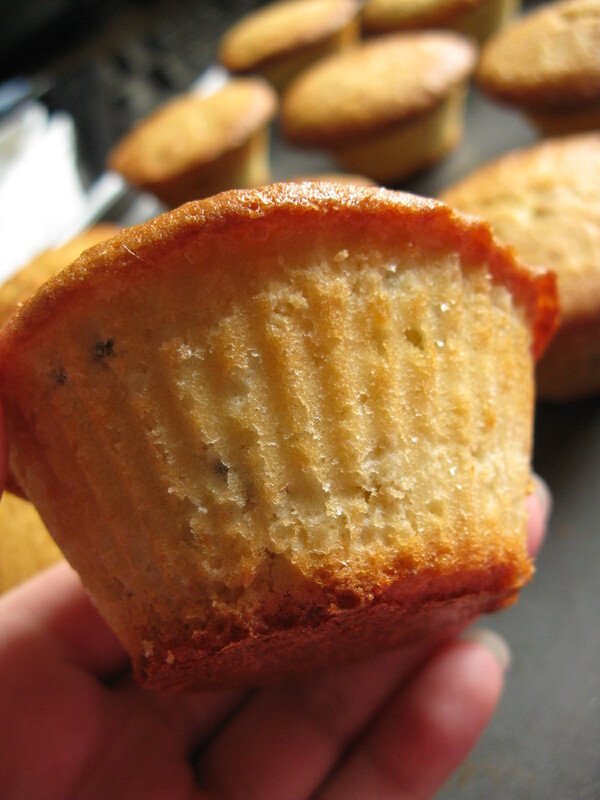 Divide batter evenly among muffin cups, and bake for 22-25 minutes until tops are golden and just dry to the touch, and a toothpick inserted comes out clean. (If you so happen to be using silicone muffin cup liners, you may need to add an extra 10-15 minutes of bake time on top of this.) Remove from oven and cool thoroughly before frosting. 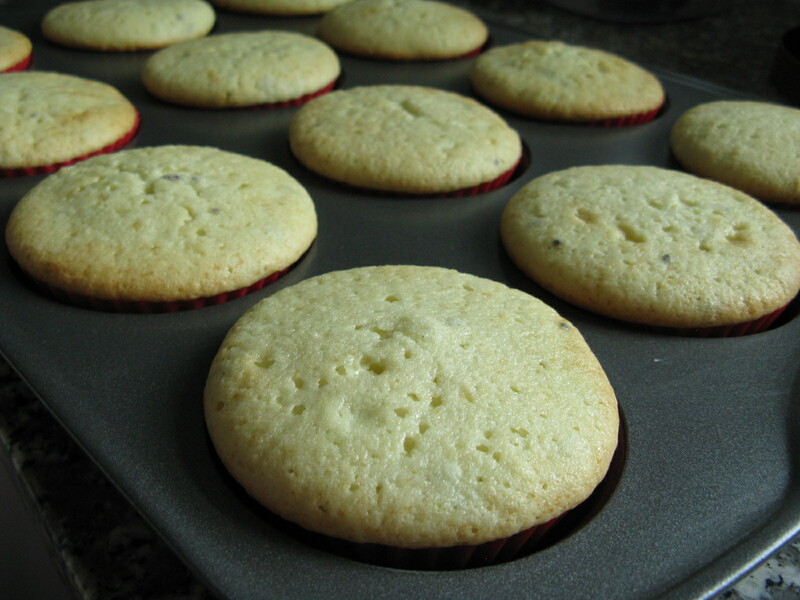 If using silicone liners, remove them as soon as the cupcakes have cooled just enough to handle. The cupcakes after another 15 minutes in the oven, finally cooked through but clearly overbrowned using the silicone liners! 7. Make the frosting: Cream butter until light and fluffy. 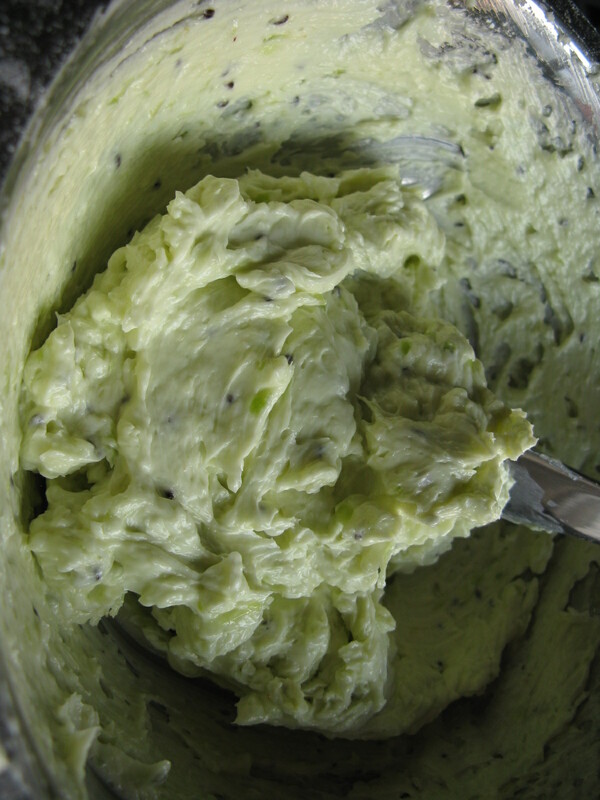 Add approx 3-5 tbsp of mashed kiwi to the butter, 1 tablespoon at a time, and blend well. You can always add more kiwi but you can’t take it back once it’s in there. Just make sure the mixture is still light and fluffy and doesn’t become watery. Now add vanilla and confectioner’s sugar, and blend thoroughly. Stop to taste the frosting, making note of the degree of sour versus sweet. The final step is to add the salt and mix well, and taste again. The frosting flavor should really round out and come together at the end, without being too sweet or too sour. You won’t taste the salt, but it will balance out the kiwi and the sugar so that the uniqueness of the kiwi flavor shines through. I swear the frosting tastes so addictive and refreshing, like a perfectly ripe kiwi, mmm! 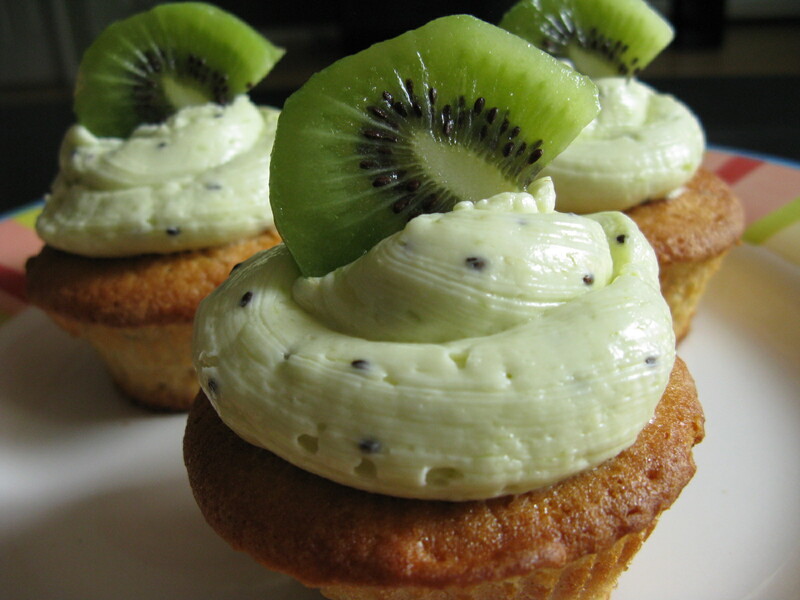 These cupcakes are best the day of, and look beautifully summery when garnished with slices of kiwi. The frosting comes out a very pale pastel green, with flecks of the black kiwi seeds throughout. You’ll find the kiwi pairs surprisingly well with the buttery vanilla in the cupcake, brightened up by the bold kiwi flavor in the frosting. I couldn’t believe how fresh of a taste it was, considering how rare it is to hear about kiwi cupcakes as a concept. Everyone who had one of these asked for a second, which must be a good sign right? ;) I know I’ll be making these again and again when I have all those extra kiwis in the summertime! So back to the pumpkin bar! One of my favorite flavors of the fall season is pumpkin. I look forward to it as the leaves start to turn color in early October, and when the cans of pumpkin start to go on sale in the grocery stores, I know it is time to break out the pumpkin themed desserts. Sure there is always pumpkin pie and pumpkin bread, but I am perpetually looking for different and unique ideas that incorporate pumpkin. This year I saw a post on Willow Bird Baking about pumpkin cheesecake sopapilla bars, and it piqued my interested because of how it combined two things I love (pumpkin cheesecake and sopapillas [a Mexican crispy fried dough topped with cinnamon sugar and honey]), and how it was sinfully easy to make (you cheat by using cans of crescent roll dough). 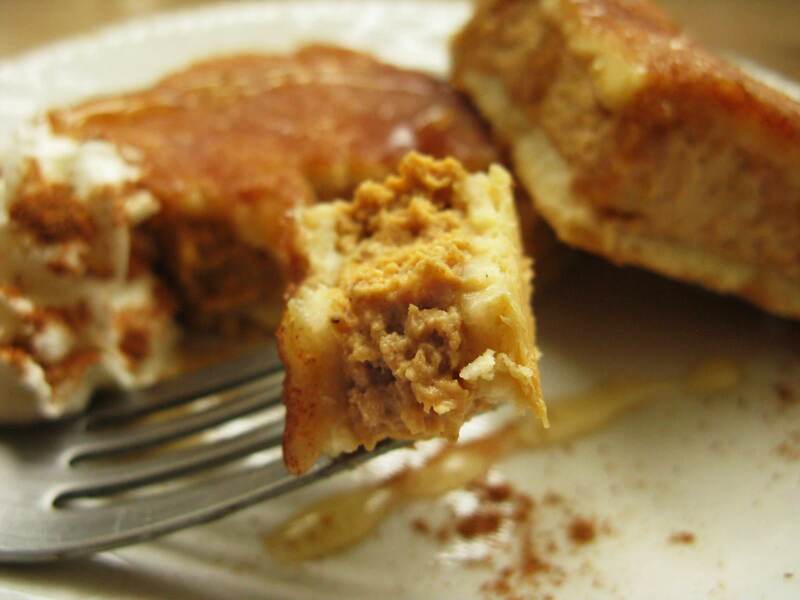 You layer the dough on the bottom of the cheesecake to serve as a crust, and then you layer it on top of the cheesecake to bake into a “sopapilla” topped with cinnamon sugar for a crunch. 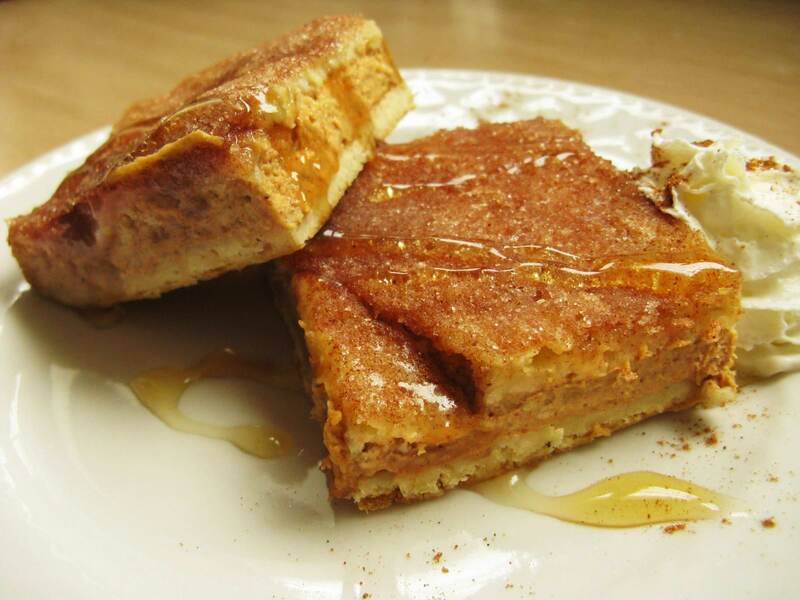 Sure, it is neither cheesecake nor sopapilla in their true forms, but as my friend put it… the bars tasted like a cross between pumpkin pie and churros. Now that’s a lot of fun in a simple bar! 1. 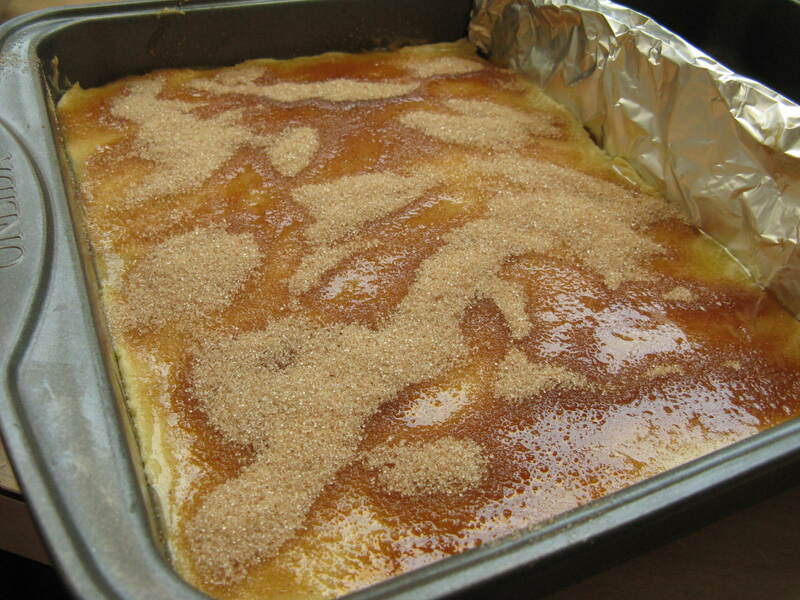 Preheat oven to 350 degrees F. Grease your 9×13″ pan (or you may use 8×8″). 2. Open and unroll crescent roll dough, divide into two halves. Press half the dough into the bottom of your pan to cover half of the 9×13″ pan – you may have to press to thin out the dough a bit. Don’t worry about sealing the edges of the triangles together. 3. Take the rest of the crescent roll dough and press it out over a piece of plastic saran wrap, until it is approximately the same size as the piece in the pan. (You may find it useful to lift your second piece of dough with the saran wrap and gently lay it over the first piece in the pan to compare the size). Try to pinch the edges of the triangles together on this piece so that the top layer of dough will be evenly sealed. Set the second dough aside. 4. 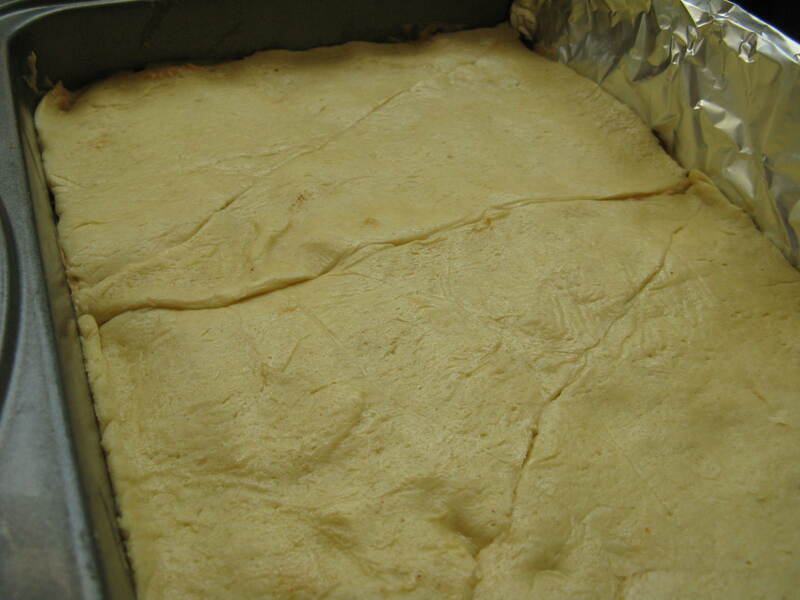 Make a small divider from aluminum foil, doubled over, and set it along the edge of the dough to help contain the bars to one side of the pan. Tuck the bottom of the foil just underneath the dough to keep it secure. 5. In a bowl, beat cream cheese and sugar together until fluffy. Add pumpkin, cinnamon, pumpkin pie spice, and salt. Stir well to combine. 5. 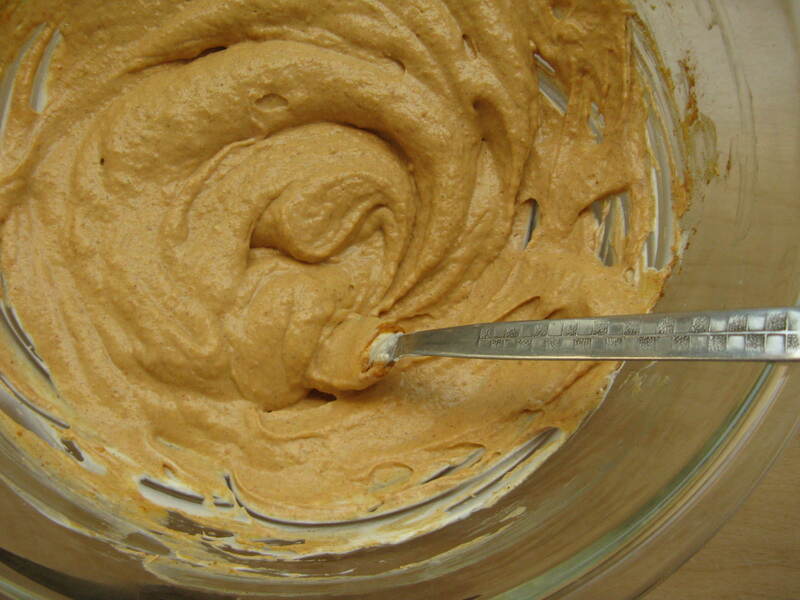 Carefully spread pumpkin cream cheese mixture over the layer of dough in the pan. 6. Using the saran wrap, flip the second piece of dough over and lay it gently across the top of the pumpkin layer. Don’t worry if it doesn’t lie perfectly flat, just try to keep the seams closed. Peel off the saran wrap. 7. Pour the melted butter gently over the top of the second dough layer. Stir together the sugar, cinnamon, and pumpkin pie spice for the topping. Sprinkle evenly over the tops of the bars. 8. Bake for 30 minutes or until tops are golden brown. 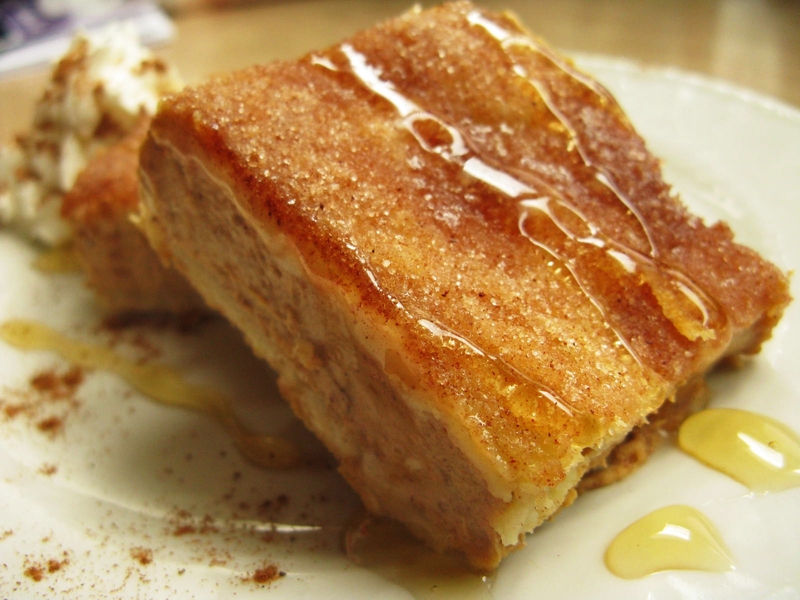 The cinnamon sugar on top will be liquid. Remove from oven and cool completely in pan. 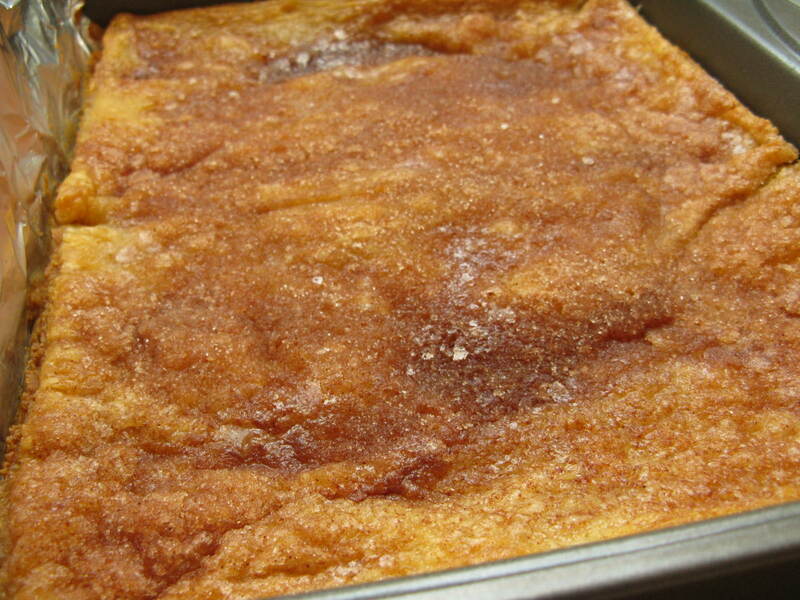 The cinnamon sugar topping will set up nicely as a crust. To serve: You may refrigerate the bars and serve them cold or warmed slightly in the microwave. 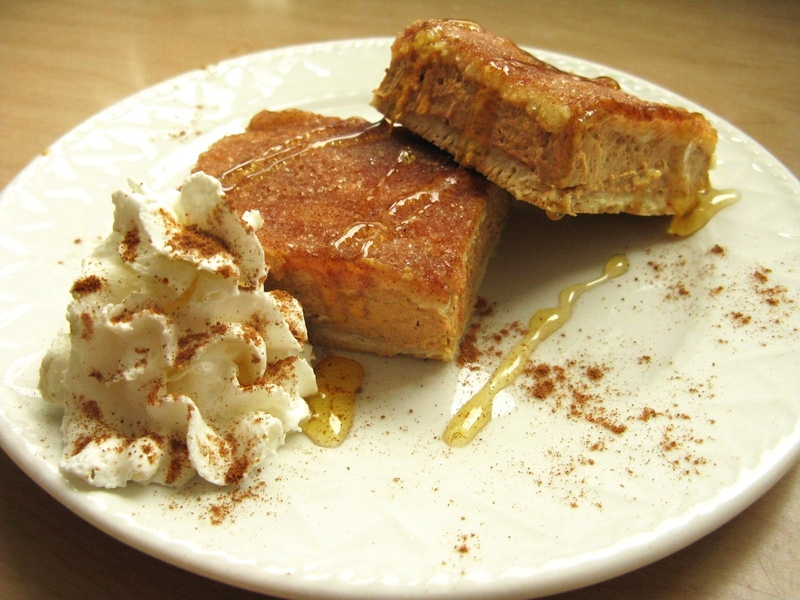 I like to give a light drizzle of honey over the tops of the bars and add a dallop of whipped cream sprinkled with pumpkin pie spice to garnish. I think the bars would be fantastic with some vanilla ice cream as well :) Enjoy! Bonus fun facts: While I was on the interviewing trail, many interviewers asked me about my food blog, as it was something that I put on my application under “hobbies”. They often asked me how time-consuming it is to make the food, do the food photography, and then write the post. I would say that making the food and writing the post is the least time-consuming part. The food photography is what takes time to set up and do. For those of you that are curious, for this recipe, I took a total of 112 pictures from which I selected the above photos to post. I’ve had upwards of 200+ pictures for a particular recipe, and as few as 10-20 pictures if I don’t photograph the process. Many people like to spend time editing their photos with software afterwards, but that takes even more time and you can edit photos endlessly to suit your tastes, so I don’t go down that route very often unless my pictures were taken in poor lighting. Anyway, just to help you put it in perspective if you’ve ever wondered :) Happy holidays! Sometimes a recipe is just so simple that you have to try it. This 4-ingredient lime cracker pie, which requires no baking and takes all of 10 minutes to put together, is definitely one of those recipes. In fact, you won’t believe how good it tastes until you finally get to take it out of the fridge and try it yourself. 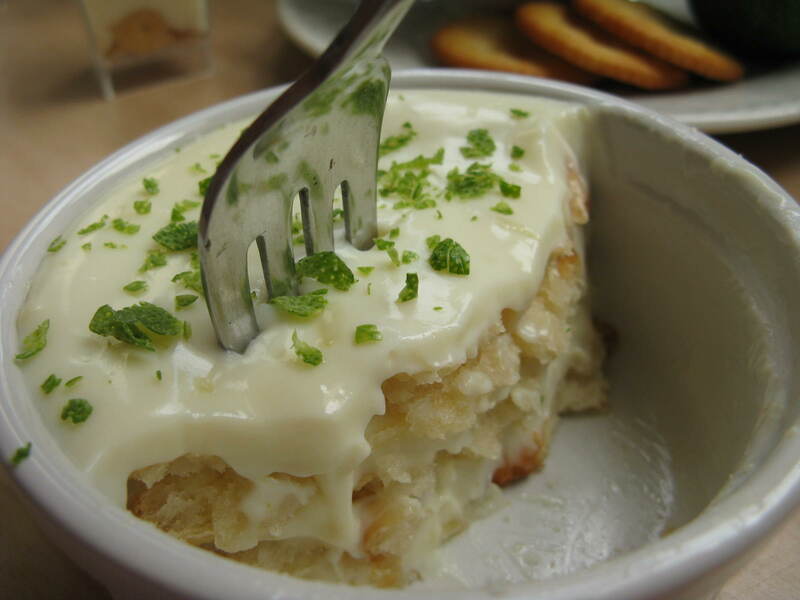 This recipe is a fantastic shortcut to key lime pie, with a similar taste and none of the work. 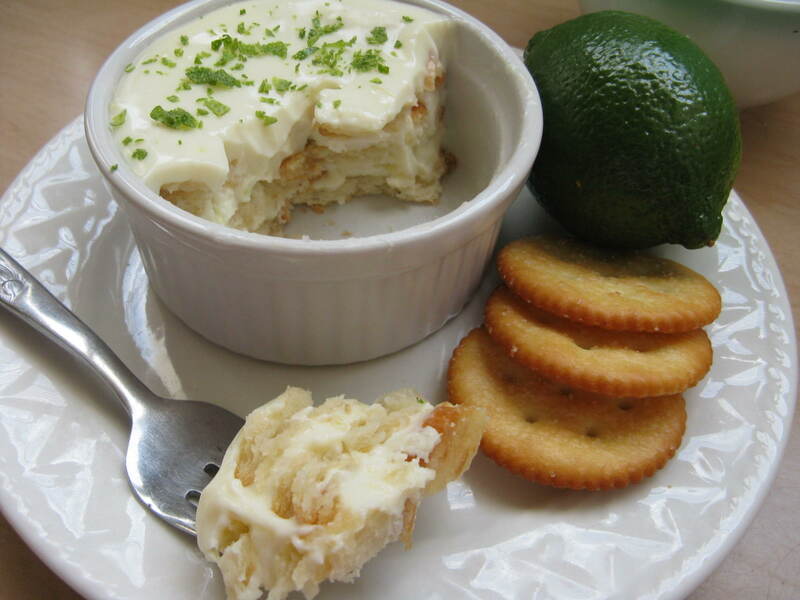 All you’ll need is limes, heavy cream, sweetened condensed milk, and some Ritz crackers (or the like). The amount might not seem like much, but a little goes a long ways with this dessert because the flavors are intense! And when you bring it to a potluck, you’d better be prepared to answer all the questions when people start gawking at you for finding such a neat dessert idea that is so easy to execute. You would think that so many Ritz crackers in the pie would come out funny and taste nothing like a dessert. But this pie uses the same technique that icebox cakes use: by layering crackers with a cream, custard, or pudding and letting it chill in the “icebox”, the crackers absorb the moisture and become soft and cake-like in texture. 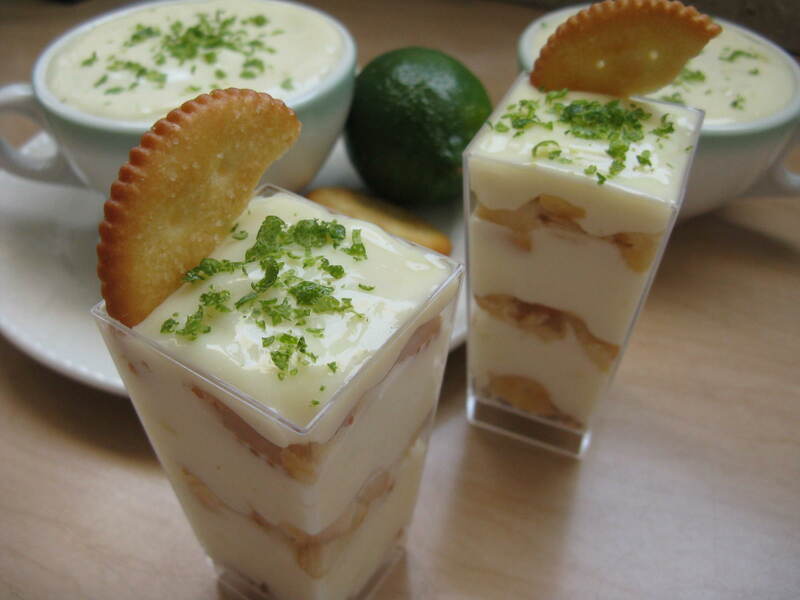 The saltiness of the crackers also balance the sweet and sour of the lime custard perfectly. The lime zest gives it a slight bite as well. The end result really ends up tasting like a key lime cake. Try it and I bet you’ll love it! So are you ready?? 1. 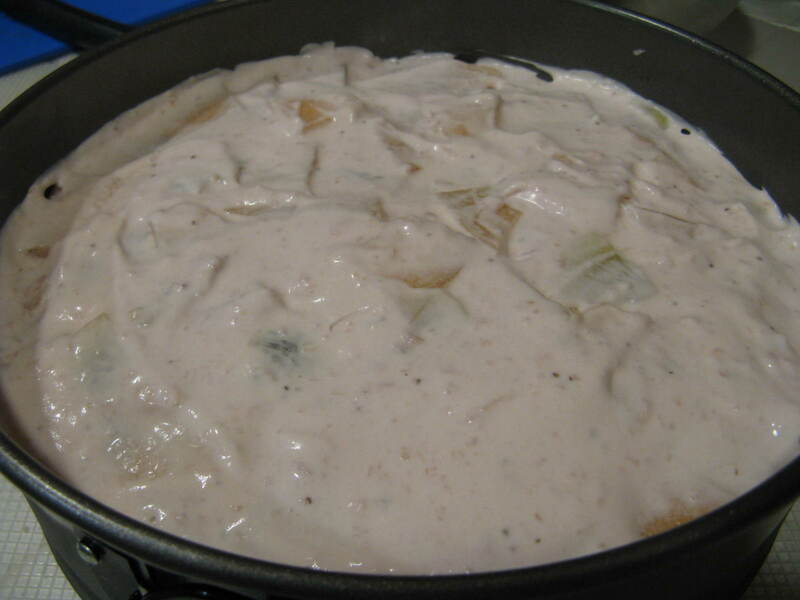 In a large bowl, combine the sweetened condensed milk and the heavy cream, mix well. 2. 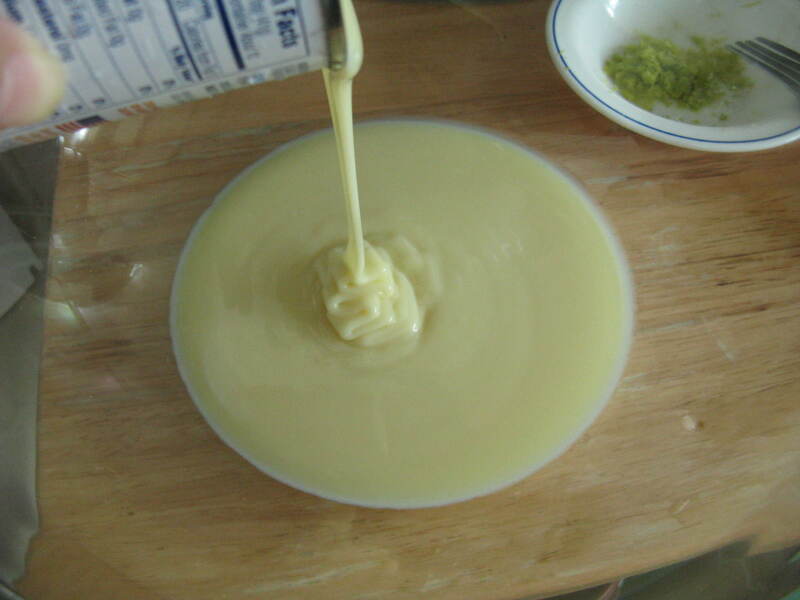 Add lime juice and stir for about 2 minutes – the mixture should magically thicken to a custard consistency. Stir in half of the lime zest, and reserve the rest for garnish. 3. To assemble the pie, you may choose to do so in a casserole dish, trifle bowl, or small cups and ramekins. 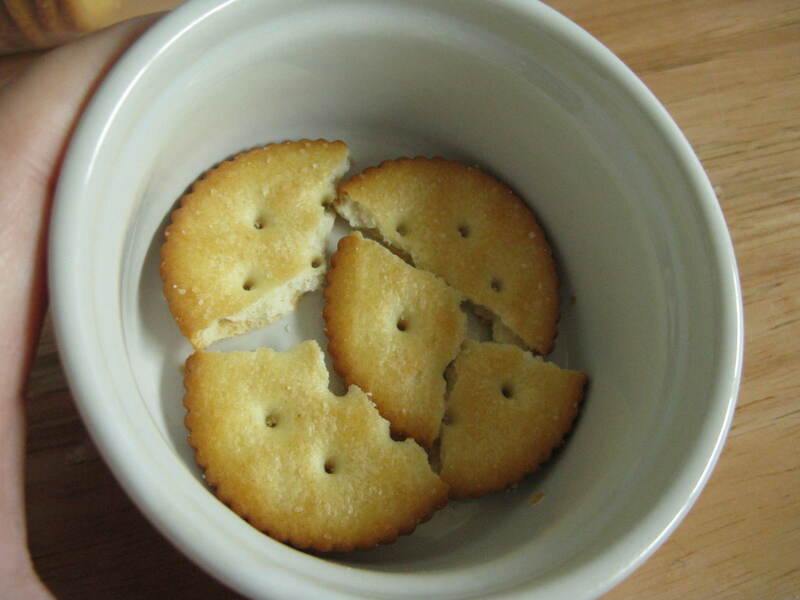 Layer the bottom of the container with crackers, breaking them as needed to fill in gaps. 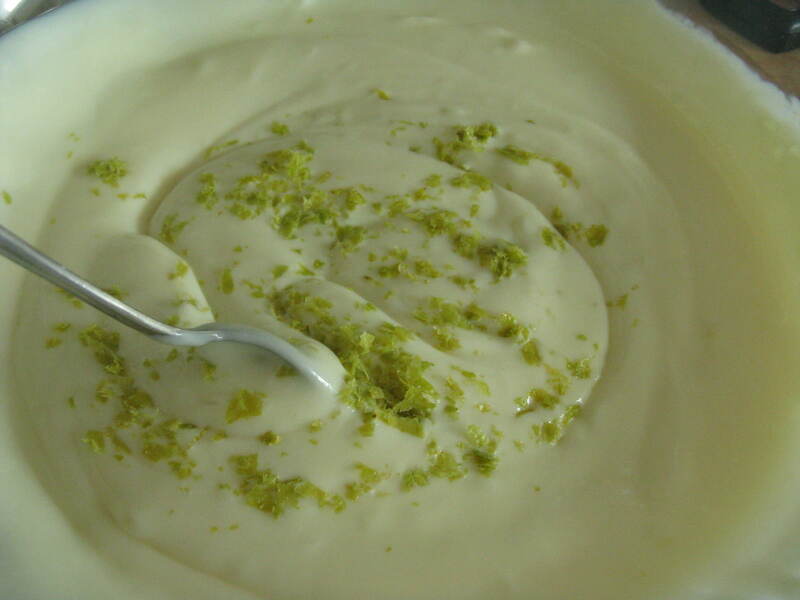 Top with 1/3 of the lime custard mixture. 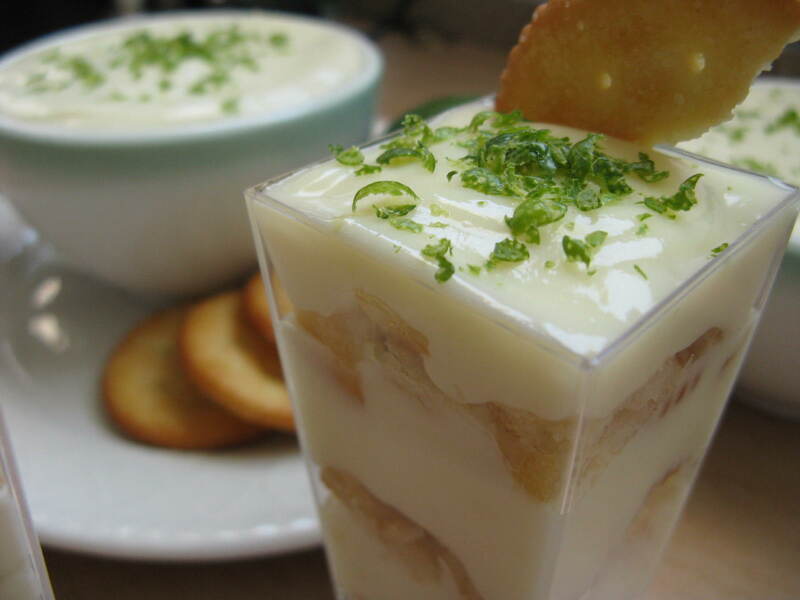 Repeat with layers of crackers and custard, ending with the custard on top to cover the crackers. You should have 3 layers of crackers, but you can do 4 layers if you prefer. Garnish top with remaining lime zest. 4. 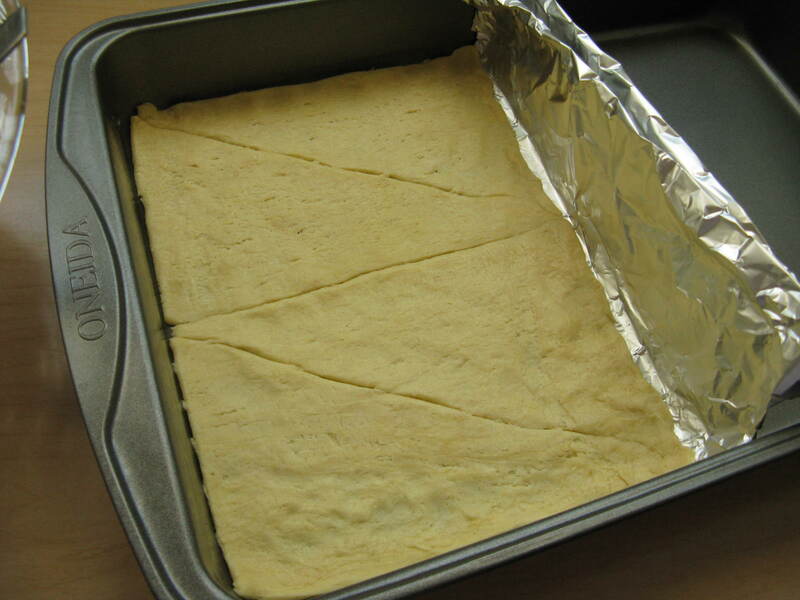 Chill lime cracker pie in refrigerator for at least 2 hours, preferably 6 hours or overnight. Serve chilled. Growing up with Chinese cooking in the home, there were a lot of unique ingredients that I had the pleasure of experiencing, often without even knowing how special they were. It wasn’t until I moved out of the house and started cooking out of my own pantry that I suddenly realized just how interesting some of these Asian ingredients were (and how hard they can be to obtain!). I sometimes start to worry that I might go stir crazy if I move to a place without an Asian market, because I’m pretty sure I wouldn’t be able to cook half the things I cook without one! It is my hope that through my posts I can introduce some of these interesting ingredients to all of you, and maybe the next time you wander into an Asian market, you won’t feel as intimidated by your surroundings. Maybe you’ll even experiment with a thing or two! Enough about me, let’s talk about today’s mystery Asian ingredient – sweet osmanthus. If that name sounds completely foreign to you, don’t worry. I had to look it up just for this post! 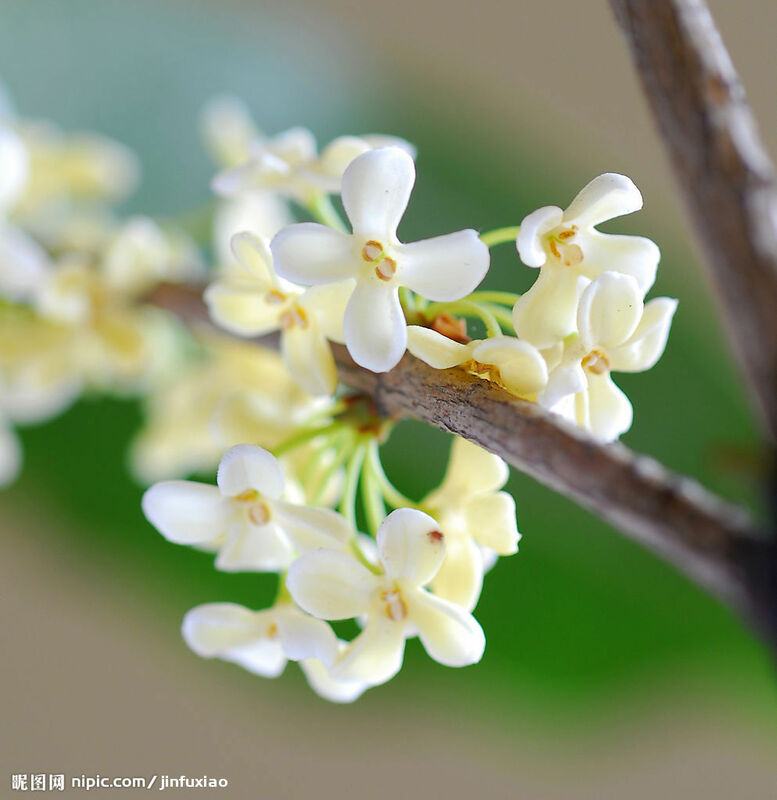 In fact, growing up, the sweet osmanthus was always called by its Mandarin name in my household: “gui hua” (桂花). It sounds something like “gway hwa”. 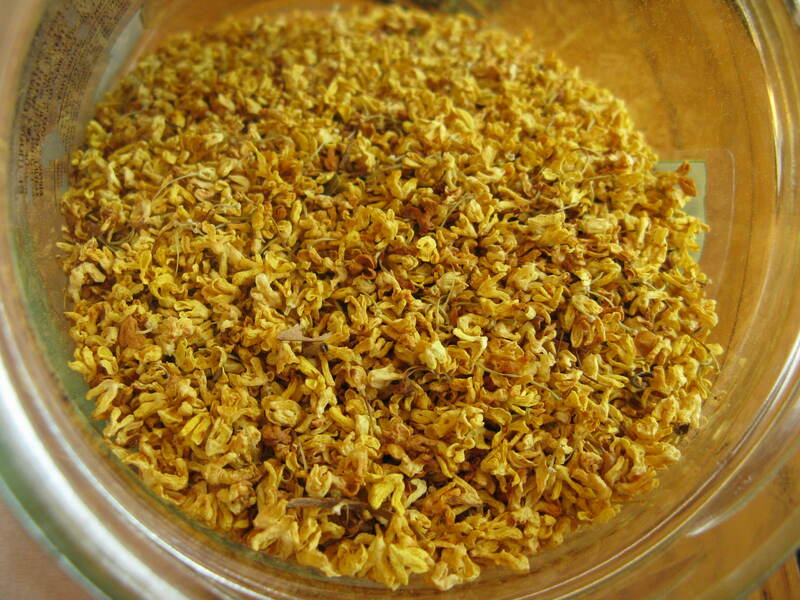 It is the fragrant dried small yellow flowers of the sweet osmanthus tree that we value in cooking. These trees are found in Asia, particularly in eastern and southern China. And if you ever have the pleasure of visiting when they are in bloom in the fall, the fragrant flowers will woo you with the scent of apricots. The flowers can be white, yellow, or even orange. The dried flowers are tiny, about the size of rice kernels, and retain their sweet fragrance. It is this sweetness that makes the sweet osmanthus so popular in Asian cooking, particularly in the desserts. In fact, you can buy the sweet osmanthus as unsweetened dried flowers, as a jam paste, or even as an infused sugar (much like vanilla sugar). 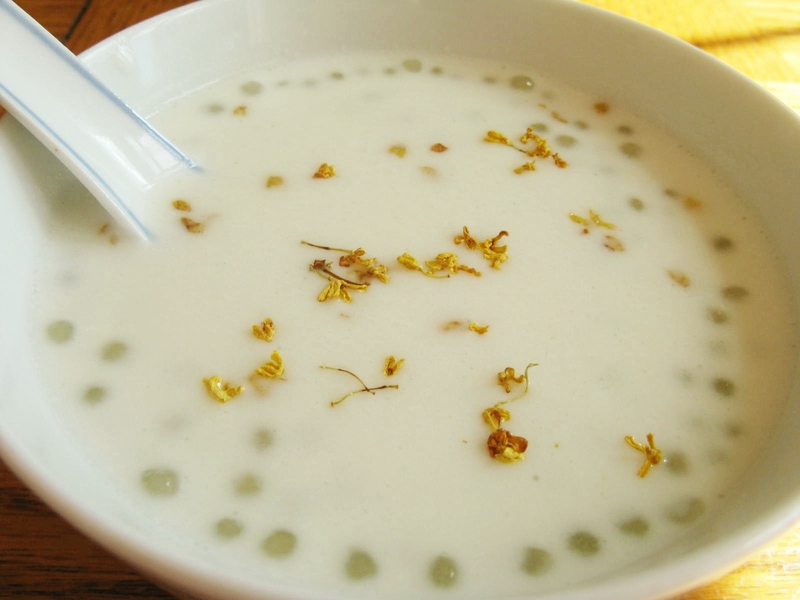 When I was younger, my mother would often prepare one of my favorite desserts, lotus root powder congee with sweet osmanthus. I know, that’s a mouthful, and you probably also have no idea what this lotus root powder congee is. Perhaps that should be its own mystery Asian ingredient post sometime! Suffice to say that it’s a thick starchy soup made from ground lotus root and flavored with sweet osmanthus sugar. 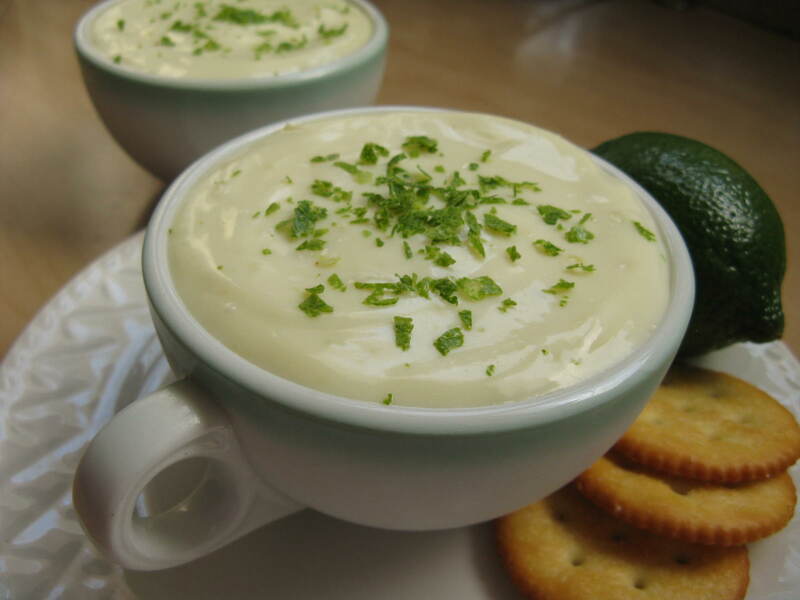 It was always warm and soothing to eat… a welcome treat in the wintertime or at night. And it was never quite complete without the sweet osmanthus sugar, although it’s hard to put your finger on exactly how the flavor changes. But you just know, when it’s not there, you’re not getting the whole package. As I grew up, I began to learn that the unsweetened sweet osmanthus flowers are often infused in teas in China. Green teas and black teas, they would only need a sprinkle of sweet osmanthus before steeping with hot water, and the fragrance would bloom. What a wonderful little flower! As it turns out, what with this tree being native to Asia and all, sweet osmanthus is pretty difficult to obtain in the US. I sort of think of it as the saffron of China. Whenever I see it in the Asian markets, sold as jam or sugar, it is at a premium price (something like $4 for a 1 oz. jar). If you are looking for it, you can sometimes find it under the name “cassia flower”, which is a literal translation of the word gui hua, but not the proper name for the flower since cassia is a different species. I have also heard that the sweet osmanthus is known as the Tea Olive down south in the US. In any case, my source of dried sweet osmanthus is typically straight from China. When I go to visit my relatives in Shanghai, they give me a baggie of the stuff, and it lasts a long time. I love infusing my tea with it, and sprinkling it into some of my desserts for a sweet fruity aroma and flavor. 1. Bring a pot of water to boil, and add the dry mini tapioca. Boil for 6 minutes, then turn off heat and cover, allowing the pot to sit for 15-20 minutes, until the centers of the tapioca are translucent. If they remain opaque in the centers, you may heat up the pot while stirring, until the tapioca are translucent. 2. Meanwhile, in a large pot, add the coconut milk and rock sugar, and heat on medium to medium-low. Continually stir the rock sugar until it dissolves completely. Do not let the coconut milk come to a full boil (it may curdle). 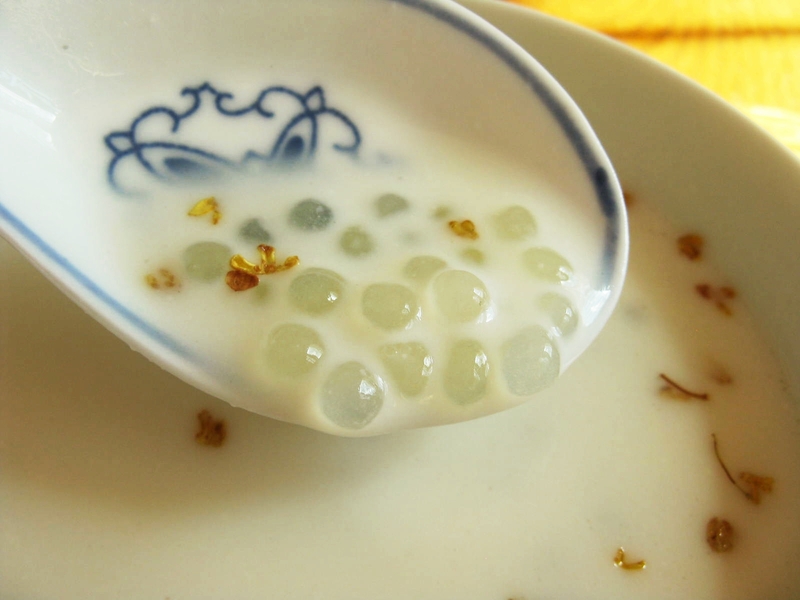 Sprinkle the sweet osmanthus into the pot when the rock sugar is nearly dissolved, allowing it to heat with the coconut milk for about 5 minutes. 3. After the rock sugar dissolves, turn off heat and stir in the milk. Taste for sweetness at this point, and adjust as necessary by adding granulated sugar or more milk as desired. It should be slightly more sweet than your final desired sweetness. 4. When the tapioca is ready, pour it into a fine sieve while running cold water over it to wash off the excess starch. Add the tapioca to the pot with the milk, and stir well to break up the tapioca clumps. Serve warm, at room temperature, or chilled, as desired. (The coconut milk may clump slightly when chilled.) Sprinkle more sweet osmanthus on top for garnish when serving. Enjoy! Since I posted about my Chinese birthday cake recipe a few years ago, it’s been my most popular post on the entire blog, and I’m thrilled that so many of you find it helpful! I’ve since made this cake several times for family and friends, and I’ve done a few variations for the original custard filling that have all been great. The simplest is to fill the center with cream and fresh fruit, which allows you to skip the custard-making step entirely. I’ve also made a taro paste filling, which is surprisingly easy to do and very popular in Chinese bakeries (post to come at a later time). Eventually I’d like to do a chestnut paste filling too, which is a favorite from my childhood growing up in Shanghai. If I were to make this cake again, I would add more gelatin or use less strawberry juice and milk in the mousse because I would have liked it to set up more firmly in the cake. The amount I used here set up more like a very thick yogurt rather than a firm mousse, but I couldn’t determine that until I had let the whole thing set up fully. So without further ado, here is the recipe below. 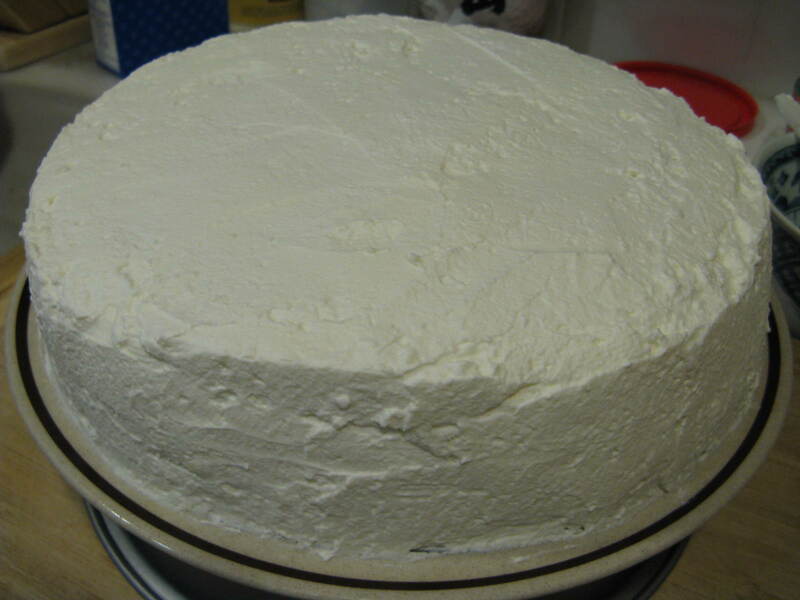 I use the same cake base as my original Chinese bakery style birthday cake, but the filling recipe is described below as well as the assembly process. Have fun! For the cake base: please see my previous Chinese bakery style birthday cake recipe. Note: you will need 1 pint total of fresh strawberries for assembling this cake. 1. Sprinkle gelatin powder on top of 2 tbsp of liquor or water in a small bowl, allow to soften for at least 5 minutes. 2. Wash and hull strawberries, chop roughly and puree in a blender. I obtained about 1/2 cup of puree. Add macerated strawberry juice and milk to make approximately 1 cup of volume total. 3. Stir in sugar, and heat puree on medium heat until just starting to simmer. Remove from heat, and stir in softened gelatin until it dissolves. Set aside puree in a mixing bowl and allow to cool to room temperature, stirring occasionally. 4. In a separate bowl, whip the heavy whipping cream until soft peaks form (for a firmer mousse, whip until stiff peaks form). Fold whipped cream into the room temperature strawberry puree. Now it is ready to use for the cake! 1. 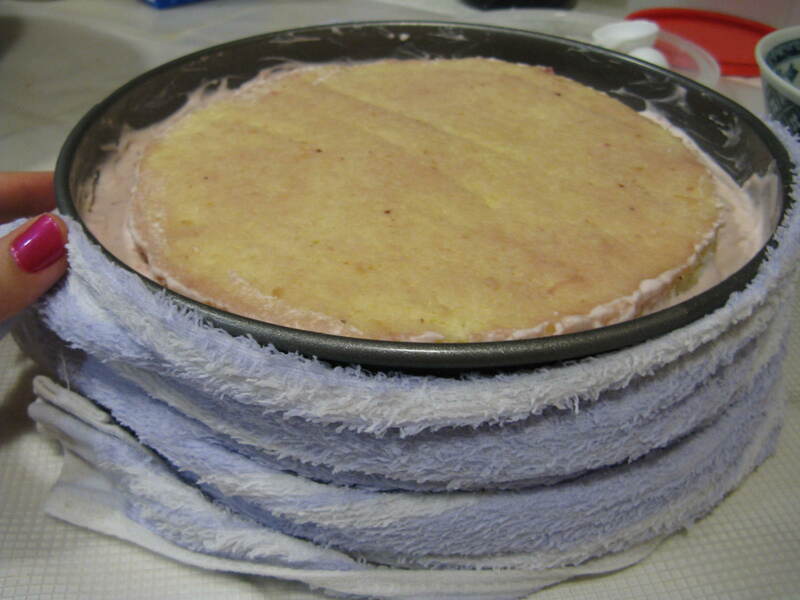 Trim the brown skin off of the cake rounds, and trim the rounds so that they are the same size. Brush both sides of cake rounds and edges generously with macerated strawberry juice. 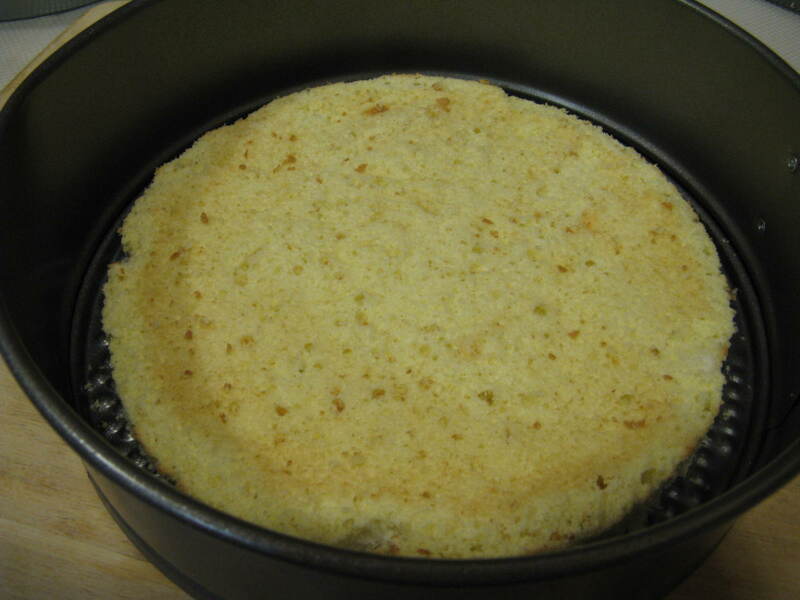 Place first cake round in a 9″ diameter springform pan (it should sit centered, with a rim of space around the edge). 2. Pour strawberry mousse over cake, letting it settle in the rims, until there is a 1cm layer of mousse covering the top of the cake. 3. Spread chopped fruit on top of mousse, gently, until covered. Pour more mousse on top and spread to sides. Reserve some mousse for the next layer! 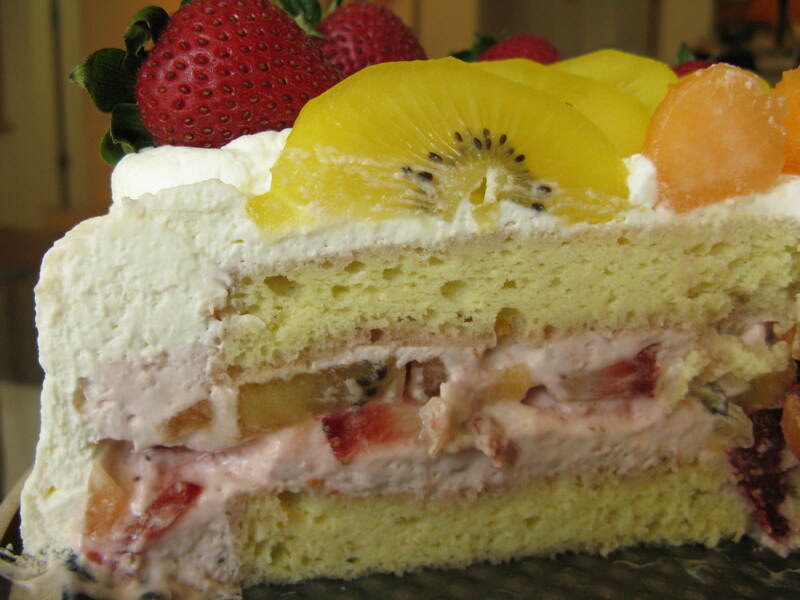 Tons of fruit layered in the middle! 4. Place second brushed cake round on top of mousse and fruit filling. Spoon remaining mousse on the side to fill the rim. If you have made enough mousse, ideally it will come up evenly on the side of the cake, but as you can see below, I came up short. 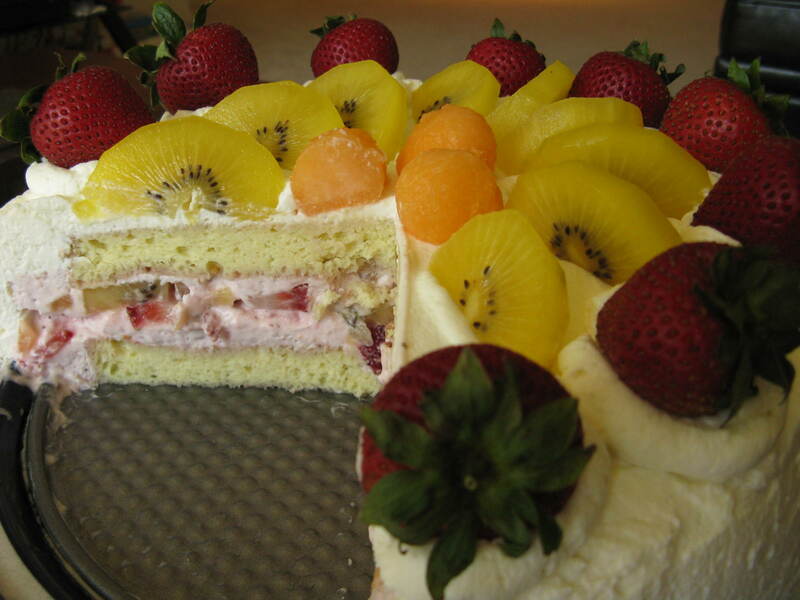 I think if you used less mousse in the middle layer that would work too (by placing fruit directly on top of the bottom cake round and then pouring mousse on top, instead of trying to get the fruit in the middle of the layer). 5. Place springform pan into refrigerator and allow to set at least 3 hours (preferably overnight). 7. 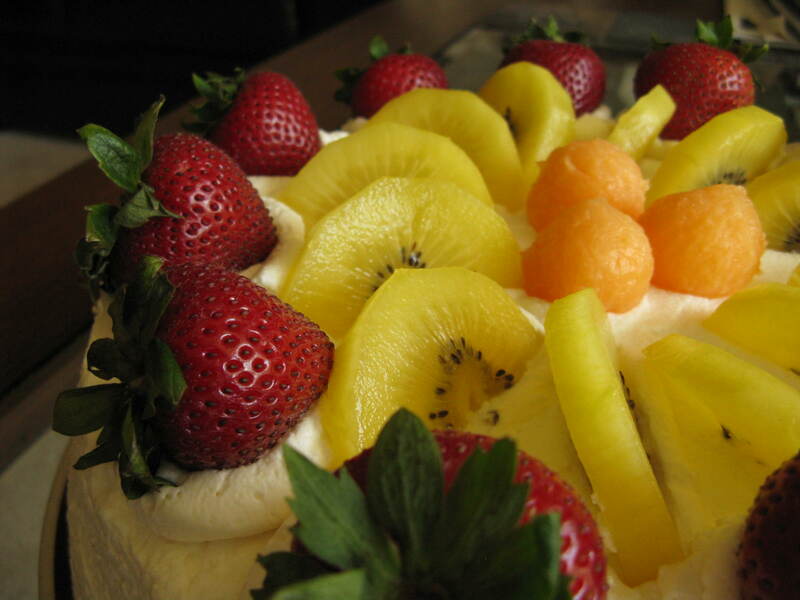 Place cake back in the refrigerator to firm up while you prepare the stabilized whipped cream recipe. Frost the cake around the edges and on top with stabilized whipped cream. 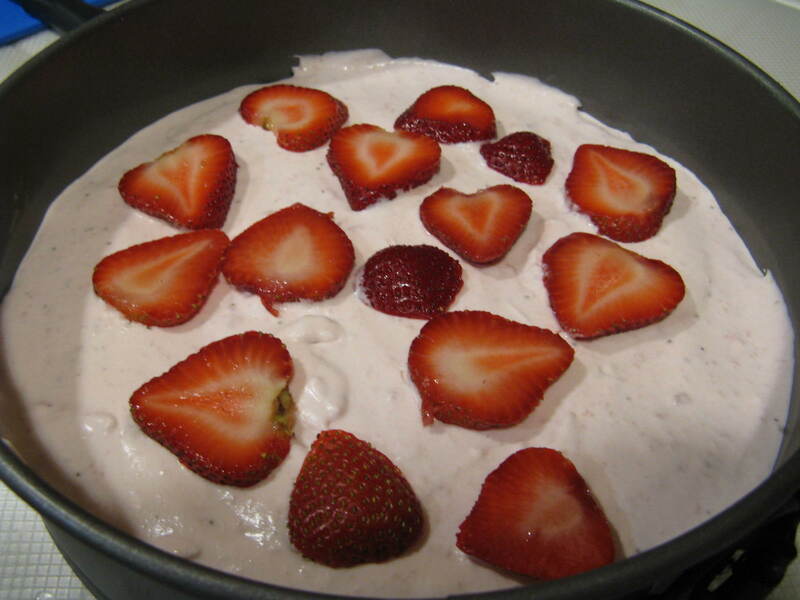 Be gentle around the strawberry mousse to avoid disturbing it. 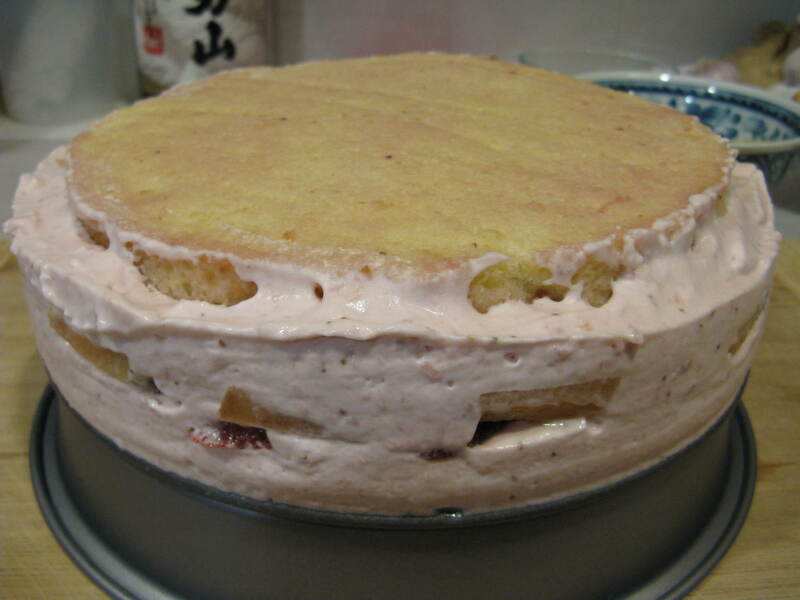 You’ll want to frost the top surface of the cake more thickly than the sides, as there is already that rim of strawberry mousse on the sides. 8. 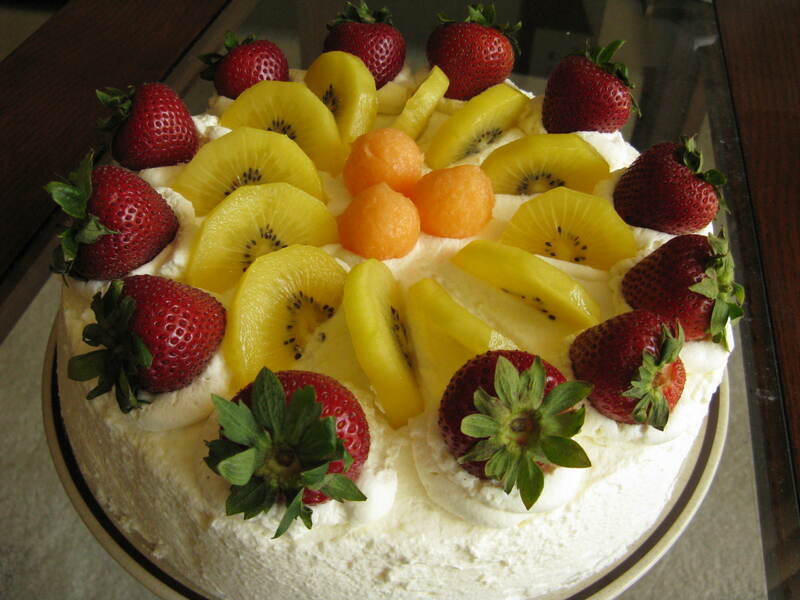 Finally, decorate top with prepared fresh fruit. Chill in refrigerator until ready to serve. The cake will keep in the fridge for at least 3 days, but hopefully it will be gone long before that! Enjoy!